Rajasthan Subordinate and Ministerial Staff Selection Board has issued notification for Supervisor Vacancies. There is 309 number of Vacancies are available for women employee of Anganwadi, Kota. Participants who are interested in RSMSSB Supervisor Recruitment 2018 may check here education qualification, age, and pay scale. Eligible Candidates should fill up their application form for RSMSSB Supervisor Vacancy from 04 October 2018. Applicants should apply online for Rajasthan SMSSB Supervisor Jobs 2018 before 03 November 2018. For more details such as selection criteria, application fee read below article carefully. Rajasthan SMSSB has published notification for filling up 309 पर्यवेक्षक ( महिला) Vacancies. The Department has divided vacancies in tow part TSP and Non-TSP area. Candidates should register online from 04 October 2018 to 03 November 2018. Applicants may apply online according to their area wise. The Department has issued this notification for women employee of आंगनबाड़ी कार्यकर्ता कोटा. Candidates should download RSMSSB Supervisor recruitment 2018 Notification either from here or from the official website. Fresh Update as on 11.02.2019: Dear Participants, The Rajasthan SMSSB Department has posponed Agriculture & Anganwadi Supervisor Examination. The Department will issue new exam date for Supervisor Examination. Applicants should stay connected with us for more updates. Fresh Update as on 12.11.2018: Hello Friends, Online Registration for RSMSSB Supervisor Recruitment 2018 has started. Interested candidates may apply online for Supervisor Post before the last date. Here we provided you complete details regarding RSMSSB Supervisor Vacancy 2018. Candidates should fill up their application form carefully otherwise, their form will be rejected. Before apply candidates should check here eligibility criteria, age, and application fee details. The Department has published this notification only for those women who already working in Anganwadi. Participants who fulfill Eligibility Criteria may apply online form links given here. Participants must have a Graduation Degree of University established by law in India along with 10 years experience as Anganwadi Worker in ICDS. Candidates may also require higher qualification in Computer Education for RSMSSB Supervisor Recruitment 2018. Check here certificate required for Computer qualification from below points. 1. “O” or higher Level Certificate course conducted by DOEACC under control of the Department of Electronic, Government of India. 2. Certificate course on computer concept by NIELIT, New Delhi. 3. Computer operator & Programming Assistant (COPA)/ Data Preparation and computer software (DPCS) certificates organized under National/ State council or Vocational Training Scheme. Applicants must have knowledge of Rajasthan Culture and have an ability to write in देवनागरी Language. Aspirants should be 18 years old and not more than 40 years old are eligible for RSMSSB Supervisor Vacancy 2018 as on 01.01.2019. The Department will applicable upper age relaxation as per government rule. Here we gave you Age Relaxation for RSMSSB Supervisor Jobs 2018. Consult official RSMSSB Supervisor Notification 2018 from more information. Here we gave you links to download RSMSSB पर्यवेक्षक Recruitment notification. Participants can pay their application fee through online mode for राजस्थान महिला पर्यवेक्षक भर्ती 2018. Candidates may use their Credit Card, Debit Card, and Internet Banking for the payment of application fee. Here we gave you table which shows you RSMSSB Supervisor Jobs 2018. Selection of Candidates should take place on the basis of written examination. Participants should appear in the written examination. Applicants who qualify written examination will get allow to participate in Interview. Aspirants should read official RSMSSB Supervisor Notification 2018 carefully. Candidates should download Rajasthan SMSSB पर्यवेक्षक Recruitment 2018 notification either from here or from a link given below. The Department will pay a good amount of salary to the selected candidates. Participants who get selected for Supervisor post will get salary on the basis of Pay Matrix Level-7 ( Pay Scale of Rs. 5,200 to Rs. 20,200 with Grade pay of Rs. 2400 ). 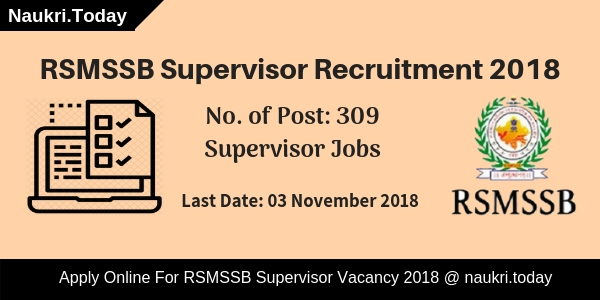 For further more information aspirants should read official RSMSSB Supervisor Recruitment 2018 notification. Applicants should read this article carefully before applying for RSMSSB Supervisor Recruitment 2018. Here we provided you complete details regarding eligibility criteria, and selection process. Participants should follow these steps to apply for RSMSSB पर्यवेक्षक Jobs 2018. Log on to Official Website of Rajasthan SMSSB i.e rsmssb.rajasthan.gov.in. After that search for RSMSSB Supervisor Recruitment section at Homepage. Now Click on Rajasthan SMSSB Supervisor Vacancy PDF link. Candidates should read complete Notification carefully. Eligible aspirants should apply online for राजस्थान महिला पर्यवेक्षक भर्ती . Now Insert your passport size photo or signature in an Application form. After that Recheck your form carefully. Participants must keep on a copy of application form for feature use. Click Here To Apply Online For RSMSSB पर्यवेक्षक Jobs 2018. Conclusion: Rajasthan Subordinate and Ministerial Staff Selection Board has announced 309 vacancies for Supervisor post. Candidates should check here eligibility criteria or other details for RSMSSB Supervisor Recruitment 2018. Here we gave you links to apply for राजस्थान महिला पर्यवेक्षक भर्ती . Are you searching RSMSSB Supervisor Recruitment Notification 2018?? If yes, then here is a golden opportunity for you. 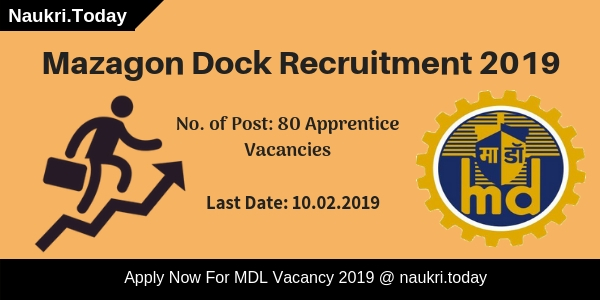 Rajasthan Subordinates and Ministerial Services Selection Board has published recruitment notification for 180 Supervisor (महिला अधिकारिता) Vacancies. Applicants who are interested for Rajasthan SMSSB Supervisor Jobs may apply online either here or official site. The last date of RSMSSB Supervisor Vacancy is 04.05.2018. Furthermore, details regarding this vacancy is mentioning in below section. 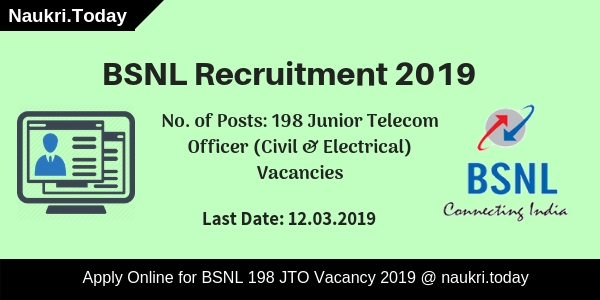 Rajasthan Subordinate and Ministerial Services Selection Board is inviting online form for recruitment of 180 TSP & Non-TSP Supervisor Vacancy. The RSMSSB Supervisor Bharti application form starts from 05.04.2018. Interested and eligible candidates can fill Rajasthan SMSSB Online form either here or official site. More information of RSMSSB Supervisor Jobs is mention of below section. Interested candidates must ensure that they are eligible or not for RSMSSB Supervisor Jobs 2018. It includes details of education qualification, age limit, and other eligibility. before applying all candidates should check the given information. Candidates should be Graduate from any university established by the law of India. Applicants also have working knowledge in Devnagri Lipi and Rajasthani Culture. Furthermore RSMSSB Recruitment Notification 2018. The department also decided age criteria as on 01.01.2019. According to age criteria date, applicants should not be less than 18 years. The maximum age need for RSMSSB Supervisor Recruitment 2018. Upper age relaxation is also applicable as per govt. rules. Applicants selection will be made on the basis of written test. Those applicants are successfully registered for RSMSSB Supervisor Bharti 2018, can attend the written test. There will be no interview. For more details, you should check RSMSSB Syllabus 2018. Applicants monthly salary will be made as per 7th pay commission and pay matrix 10. After joining they will receive Rs. 33800/- to Rs. 106700/-. For furthermore information check official notification. Applicants will pay their RSMSSB Supervisor Job application fees either online or offline mode. Furthermore, details check Rajasthan SMSSB Supervisor advertisement. RSMSSB Supervisor Notification is raised for filling up a vacancy in Women empowerment department. Applicants who are interested and also eligible for Rajasthan SMSSB सुपरवाइज़र Bharti may apply through online mode. Before going to apply for RSMSSB Supervisor Vacancy you must have valid email id and scan copy of photo & signature. If applicants find difficulties to fill online form, they can follow given below steps. First of all, applicants visit official website www.rsmssb.rajasthan.gov.in. Find recruitment notification of RSMSSB सुपरवाइज़र भर्ती 2018. Click on the link and now read the advertisement carefully. Then go to SSO portal, sso.rajasthan.gov.in. Enter all information which is required for RSMSSB Supervisor Recruitment. Make payment of application fees. Submit your RSMSSB Supervisor Job application form. You can directly apply online through the link mention on below section. Conclusion: Rajasthan SMSSB Recruitment 2018 for 180 सुपरवाइज़र Jobs. Applicants can apply through online mode from here. Candidates may fill their Rajasthan RSMSSB Supervisor Recruitment form before the last date 04.05.2018.